Well, this is sort of a good-news-bad-news post. 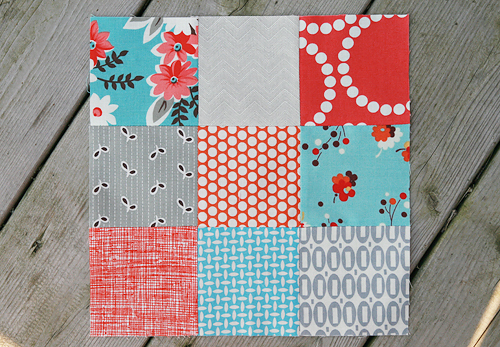 The good news - I'm making some bright, fun scrappy nine patches! I wanted to work on something sort of simple for a while and this hit the spot. I was really inspired by the colors in the Flea Market Fancy reprint. I'm not sure how many I'm going to make, but I plan on sashing them when I'm done. The bad news is, as I was making these fun little blocks, my sewing machine ran into an issue and it is now at the Bernina doctor. I don't think it's anything serious, probably just my own fault for not keeping up with the proper servicing. The thread is catching at some point inside and it is not pulling through during stitching. One stitch everything was working and the next it wasn't. I'm so sad, because this weekend I have plans to go to a sewing day with somereallysupercoolpeople. I do have a back up machine. I haven't used it in 2-1/2 years and it's pretty basic. So hopefully I can find all the pieces and get it going for Saturday. In any case, I may be Bernina-less for the next week. I think I must have looked really sad when the nice lady at the store told me, she sympathized. Crossing my fingers for a quick-servicing miracle though! I will leave you with this picture of a rooster from my weekend trip. Because, well, I may not have many sewing pictures to share for the next week!